On the last Fathers Day I started to think of my own father. On the day after Christmas in 1977, my father died suddenly at the young age of 57. I was just 21, newly married and still finding my way in life. He had been a good man, a good father, a good example to me as a grew up but he was suddenly gone. And with his sudden death, I was left without any male mentor. My then wife had lost her father when she was 9 years old, so we were both suddenly fatherless. The only males around was an older brother and my peers in the Police Force and the various sporting clubs I belonged to. There is an old saying in the Bible when Jesus taught about “the blind leading the blind fall into the ditch”. Wisdom and good advice was lacking or if it was there, I ignored it. Looking back over the forty years since my father died, there were many times in my life that having his advice, wisdom and counsel would have made so much difference. Part of the problem I recognise now was the need to “know it all”, to be the “man of the house” and hence have all the answers, provide the leadership, know what has to be done. Yet inside, I didn’t know the answers … and my Dad wasn’t there. I maintained the bravado of self sufficiency without any substance to back it up and I made many mistakes, allowed wrong attitudes to prevail, made bad life choices. I am sure I am not alone in this. Whilst my life didn’t go down the path of crime or violence or drugs. I know that I could have been a better man. There will be many who read this and have their own “absent father” experience. Whether it be because of death (like me) or divorce or a father who was emotionally absent and uninvolved in their lives, the result is the same. I felt like I was on my own. So that’s why Challenge 7 – Being the Role Model is so important. As fathers or grand fathers or a relative or just a friend. We can all make a difference in some young man’s life by being a role model to them. That then brings us back to the Values question in Challenge 1. What are your values? What is the foundation of those values? Do they stand the test of time? Are your values you want your son, someone else’s son to follow and imitate? We will explore this some more in the next post. Now that I have officially “launched” this project, I wrote this introduction to the Real Men Challenge Manual. Why the Real Men Challenge? Family violence continues to be one of the most serious social issues of our generation. One woman a week is killed at the hands of a current or former partner in Australia. One in four children are exposed to domestic violence. One in five women have been sexually assaulted and/or threatened since turning fifteen. I have been a White Ribbon Ambassador for 5 years and have been working with my local communities to take action to prevent violence against women for many years. I often tell the story of my first encounter with a family violence incident in 1976 when I was just a young inexperienced 19-year-old Policeman stationed at South Melbourne. That incident has always stayed with me and the stories of the many survivors that have been shared with me has been part of the motivation to write this book. 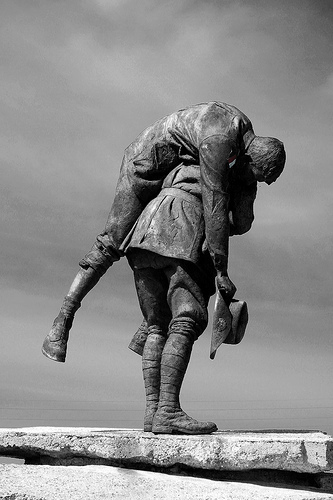 The original “Cobbers” statue by Australian sculptor Peter Corlett stands in the Australian Memorial Park at Fromelles in France. With respect for the fallen, I have taken the inspiration of the courage and self-sacrifice of these men as we have developed the Real Men Challenge. At its core is about men helping men “Stand Up, Speak Out and Act to prevent Men’s Violence Against Women”. (The White Ribbon Oath). I believe it is time for men to show leadership in their homes, in their workplaces, in their community and show young boys, teenage boys and young men a better way to live their lives. This book is to help them do just that. But what does all this mean to ordinary Australian blokes? Our neighbours and our friends? Since the release of the framework, additional academic commentary has emerged using terms such as “toxic masculinity” or “hyper masculinity”. Again, what does all this mean to ordinary Australian blokes? Over the past 8 plus years I have had numerous opportunities to speak about this issue. These have included schools (staff and students from all age levels, including Junior School); businesses; sporting clubs and a variety of community groups. In those discussions I have observed a common theme emerging around how to engage with men and the variety of hard questions that arise around men. In June 2018 I attended a “Male and Masculinity” forum sponsored by Women’s Health Goulburn Northeast which started to look at the question of “what is a man”. A conversation was started but there were more questions than answers. “Men want to be good”. That may be true, but the issue is that they don’t know how and many are trapped in their upbringing, culture and thought patterns. So when they are confronted with negative commentary on men like “toxic masculinity” they often see this as a personal attack on them and their “masculinity” and they stop listening and the message gets lost. This is not a poor men statement, but just a statement of reality about the difficulty of communicating this message to the men who need to change, those who want to be good but don’t know how. That is where the Real Men Challenge can help. So, what is this manual all about? It provides a guide for men about “how to be good” and what is a “positive masculinity” and the missing narrative for males to help them live out in in their relationships with both their partners and their children. This manual draws strongly from my Christian roots, as Christianity provides proven model for life that has stood the test of time, but with the waning of the “Church” in the public space, those values have been overlooked. You can see the outline of the Challenges in this manual below. The manual can be a resource used by individuals but would work best in a group discussion, supported by a trained leader who will help men work through the challenges and the very real issues/problems that the challenges will raise in men’s lives. The primary challenge is Challenge 2 – Love. This will be entirely based on the “Love Chapter” from 1 Corinthians 13 which is often read at weddings, but then the principles it provides is often overlooked in the relationship. This manual will bring those principles back to the fore and help men “be good men”. Through each challenge and the various sub-sections, I will ask challenging questions of men and put that Love into action. Very proud of my local Church, Life Church who is holding a fund raiser directly after the Sunday morning service. Well done to Pastor Matt and the team for “Standing Up, Speaking Out and Acting” to do something about men’s violence against women in our community. 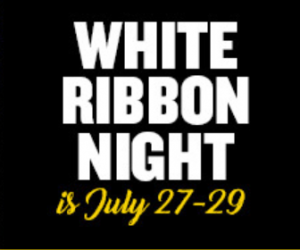 As a White Ribbon Ambassador and also Chair of the Victorian White Ribbon Committee I am encouraging everyone to do something this White Ribbon Night (July 27-29) to help raise awareness to the problem of Family Violence in our community. This is not just a national problem but affects us close to home. For example, in my local town in Shepparton Victoria, our local statistics make sobering reading with the City of Greater Shepparton 10th in the State (2016/2017) for Family Incidents reported to the Police out of 79 Local Government Areas. This equates to nearly 3 incidents per day and 26 per week. Each incidents affects people we might know, our family, our friends our workmates, our community. By hosting a White Ribbon Night this July, you will raise valuable funds for White Ribbon Australia that contribute directly to critical violence prevention programs in schools, workplaces and communities. Get your friends together on the last weekend of July to help create a future free from violence and abuse in Australia. Stuck for ideas? Here’s a few to get you started! BBQ – invite your friends over for a barbeque and charge a gold coin donation. Hold a raffle to help raise extra funds. Host a dinner – ask everyone to bring a plate, and make a donation before they try a new dish. Watch a game – pick a footy game and have your friends around to watch! Ask them to donate every time the opposite team scores a goal or try, or charge for entry. Trivia night – get quizzical! Charge your friends an entry fee, or hold a raffle on the night. You could even organise some trivia questions about violence against women to help spread understanding of the cause, as well as raising funds.